I went to the yarn store on Monday. I needed two more skeins of the orange yarn (Malabrigo Worsted #96 – Sunset) for my scarf, and I was putting off the trip because I more or less knew that the two skeins would not be my only purchase. Compared to my usual self, I’ve been a veritable paragon of thrift lately, so finally on Monday I went to Dharma Trading in San Rafael for the two skeins of orange and also enough of this variegated red/magenta/purple/pink/black blend (also Malabrigo Worsted, this time #173 – Stonechat) for a sweater. It’s hard to see how nicely the colors work together in this photo, but once the piece is larger I’ll make sure to take a photo in good outdoor light. The orange scarf is still progressing nicely, and I’ll be sure to post updates on that as well in the coming weeks. Having only one knitting project on needles really isn’t my style. “When the Greeks created the heroic ideal, they didn’t choose a word that meant “Dies Trying” or “Massacres Bad Guys.” They went with [a word that meant] “Protector.” Heroes aren’t perfect; with a god as one parent and a mortal as the other, they’re perpetually teetering between two destinies. What tips them toward greatness is a sidekick, a human connection who helps turn the spigot on the power of compassion. Empathy, the Greeks believed, was a source of strength, not softness; the more your recognized yourself in others and connected with their distress, the more endurance, wisdom, cunning, and determination you could tap into. The nearly indestructible Achilles had his loyal friend Patroclus. Odysseus fought his greatest battle with two loyal herdsmen by his side. Even Superman, who wasn’t human at all, kept Jimmy Olsen hanging around. Hercules had his twin brother and adoring nephew, and when things were darkest his best bud, Theseus, was always there. And of course, brainy boy detective Encyclopedia Brown had two-fisted Sally Kimball. A sidekick is a hero’s way of looking into his soul, of drawing strength from his weakest side, not his strongest. He has to remember that even though he shares the blood of a god, he’s still human at heart. He’s not a Titan who will swallow a baby to get out of a jam or a god who will never die. He has one shot at immortality, and it’s in the memories and stories of the grateful and inspired” (29-30). 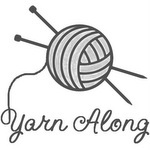 Yarn Along is hosted by Ginny on her blog, Small Things – which is even lovelier than usual this week because BABY GOATS. If you haven’t already, I encourage you to check it out. And P.S. Did you know that Hercules had a “twin brother and adoring nephew”? I didn’t know Hercules had a twin brother and adoring nephew. Is it possible the author is confusing him with Scooby Doo? If I still had a 10th grade honors English class at my disposal, I would ask them. Honors sophomores always know all the mythology questions. And P.P.S. Encyclopedia Brown!!! I can’t remember the last time I heard that name. The passage I quoted above gets a little cliché at times, but because Encyclopedia Brown got the “of course” instead of Achilles or Hercules, I will forgive Christopher McDougall for a few clichés. And P.P.P.S. Stonechat? What kind of name is that for such beautiful yarn? I hereby rename it: SANGRIA. Pretty yarn! I agree, “Stonechat” is an odd name but I kind of like it. I’ve noticed that you always knit with straight needles and would be interested to hear why you prefer them. These days the trend is using circulars for everything but back in the dark ages when I learned to knit it was unheard of, if one could even find circs! I think I learned the old-fashioned way too (though the woman who taught me used circs sometimes). I use circs for neckbands and occasionally for whole projects, but not often. Your book intrigues me! And your yarn is quite stunning, especially in its new name!